Houston Congregation for Reform Judaism’s project is called Plan Bee: Honey Production in a Jewish Context. 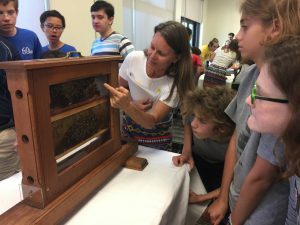 Plan Bee’s mission is to offer a range of learning opportunities for students of all ages that revolve around the production of honey from a bee hive. Toward that end, Plan Bee will include a curriculum that will tie Jewish learning to honey and honey production and weave eco-centric values and ethics together with the cycles of the Jewish calendar and the holidays. The program will also include volunteer opportunities for the congregation at large. Students will learn with a professional bee keeper and some will be involved in the hands-on process of harvesting and bottling the honey. Honey produced from the hives will be sold, used in congregational events, and gifted. Both the communal rituals that incorporate the honey as well as the religious school curriculum will highlight the centrality of honey in Jewish lore, thus adding a new dimension to their understanding Jewish text. Finally, the honey bee program will provide an opportunity for adults and children to be part of a congregation-wide project designed to broaden their community’s reach in the realm of social justice and environmentalism.